A pair of $125,000 added-money features, the Grade 3 Valedictory and Ontario Lassie Stakes, share the Sunday spotlight at Woodbine. Two standout 7-year-olds, each with 41 starts to their name, and both with seven starts on the year, will vie with seven other starters to take top honors in the 1 3/4-mile Valedictory, one of two stakes served up on the 10-race card. Multiple graded stakes champ and fan favourite Melmich seeks his second Valedictory crown, while stablemate Pumpkin Rumble goes after his third straight score on the season, both sent out by trainer Kevin Attard. A 7-year-old son of Wilko, millionaire Melmich took the 2015 edition of the Valedictory for Stephen Chesney and Cory Hoffman, going on to finish second in each of the past two runnings. This season, the Ontario-bred gelding has one win, four seconds and a third from seven starts. The chestnut, bred by Andy Stronach, heads into Sunday's race off a win on November 10 at the Toronto oval, a three-quarter of a length triumph at 1 1/16-miles. In 41 career starts, Melmich, a five-time graded stakes victor, has 17 wins, 13 seconds and four thirds. Pumpkin Rumble, who has also gone postward 41 times, rolls into the Valedictory in top form, having won two consecutive races. Owned by Al and Bill Ulwelling, he turned heads with a top-notch performance in the prep for the Valedictory on November 16. Sent off as the 5-2 second choice, Pumpkin Rumble, who sports eight wins, eight seconds and eight thirds, rumbled to an authoritative 6 3/4-length win at 1 5/8 miles on the Tapeta. The Pennsylvania-bred has three wins and two seconds from seven starts this year. Same amount of career starts, same number of starts on the season and same age… do they share anything else in common? A. A. Azula's Arch, a three-year-old daughter of Arch, completes the Attard Valedictory trio. 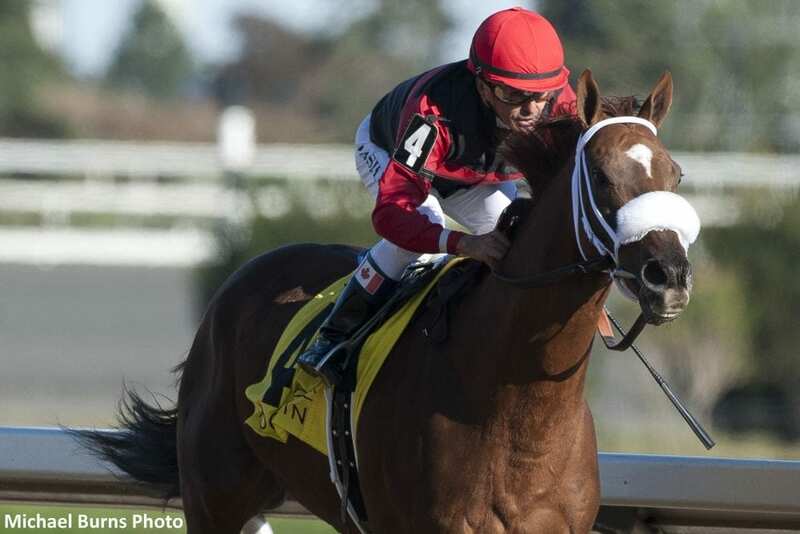 Owned by A & A Farms, the Kentucky-bred filly will be looking for her second straight Grade 3 title, after taking the Maple Leaf Stakes on November 3. Dismissed at odds of 16-1, A. A. Azula's Arch held on gamely for a neck victory in the 1 1.4-mile main track event. Attard has high praise for the lifetime winner of three races from nine starts, who also has three seconds on her racing résumé. This entry was posted in Racing and tagged kevin attard, melmich, valedictory stakes, woodbine by Press Release. Bookmark the permalink.